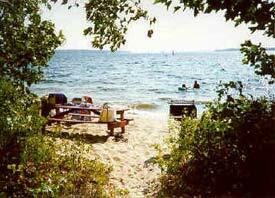 Sebago Lake offers beautiful sandy beaches and sandbars to enjoy all around the lake. Below is a listing of many of them. Location: Just off Route 302, across from the Raymond Shopping Center, and behind Jordan Bay Veterinary Hospital. A four mile drive from the Windham shopping area and a seven mile drive from Naples. 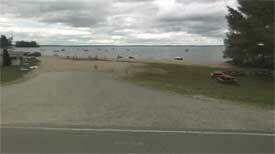 Tassel Top Beach is situated on 35 acres on the east shore of Sebago Lake. A stand of mature pines and hardwoods grace the entrance to the park and the park road leads you to a graveled parking lot. 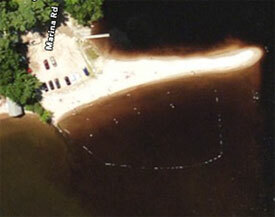 A short walk brings you to over 900 feet of sandy beach, one of the best beach areas on Sebago Lake. The beach has a secured swimming area marked by buoys; however there is no lifeguard supervision. The beach area has many picnic tables and outdoor grills for your convenience. Changing rooms are also available for your convenience. Tassel Top offers a fully stocked Snack Shack with ice cream, candy, drinks, snacks, clothing, sundries and more, for your convenience. 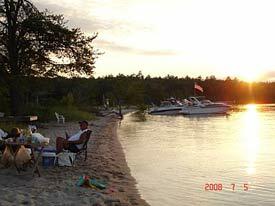 Also see Nason’s Beach Campground. The Beach area, Boat Launching area, and Parking area of the Town of Sebago shall be reserved for the use of Residents, Taxpayers, and their Guests only. Only those vehicles identified with an Official Beach Pass issued by the Town of Sebago will be permitted to park in the Beach parking area. All others will be towed at the owner’s expense. No motor vehicles of any kind will be allowed on the beach from April 1st to October 30th. All persons are responsible for removing their own trash. No glass containers are allowed at the beach. No fires of any kind, including a ban on smoking at the beach. No camping allowed. No animals leashed or otherwise. Located on the west shore between the 2 mile markers and Harmon’s Beach. 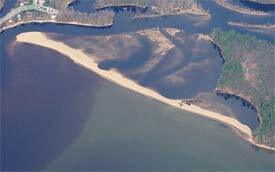 The beach, owned by Portland Water District is located on the west shore between the 2 mile markers and Harmon’s Beach. The Boating Club leases the beach & upholds rules set forth by the PWD. It is accessible only from the water. Only boats registered by legal residents of Standish or those belonging to members of Sebago Boating Club are permitted on the Sand Bar beach. Located at the Northern Shore of Sebago Lake inside the borders of the Sebago Lake State Park. A natural sandbar with gradual depths that make the beach great for families with children.